Yesterday was a momentous day. It was the day I finished my ongoing battle with rust. 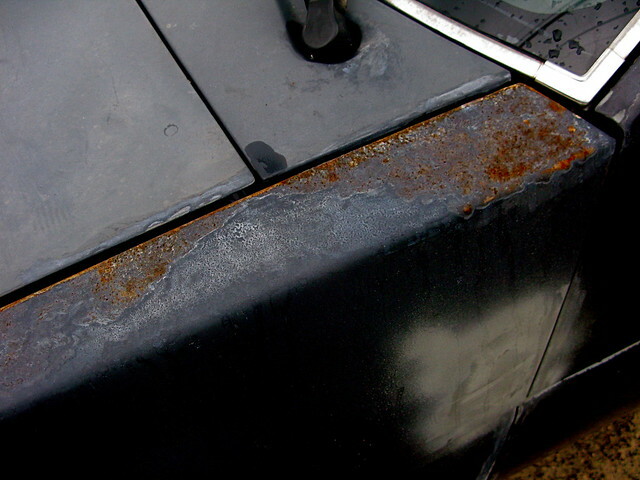 Living here in Hawaii, and especially living as close to the salty ocean as I do, I have to constantly deal with things getting corroded and rusty. My truck has been battling it for over 5 years and is finally cured. It has taken some time, a lot of work, many hours of grinding, prepping, sanding, priming, painting, and so much more but the task at is complete. After working nearly 14 hours yesterday my 1994 Nissan Hardbody Pickup Truck has been cured of it's rust, painted, washed, and detailed among a few other fixes. It's sad that it has taken me so long to get to this point (I've had intentions to have this completed months and months ago) but the task can be crossed off my list of things to do. My truck has never looked so good in all the days I've owned it. It's a shame I'll only be able to enjoy it for about a month before I have to sell it and move. I was planning on being done at about two or three in the afternoon on Saturday so I could continue my goal of surfing every day before I leave Hawaii (I'm not good, but I enjoy it and have been going consistently as of late) but things went into overtime between this and a few other projects. Because of this I ended up not getting done till eight at night. My goal of surfing was ruined. When I got home Grant and Chad were bored and there was nothing going on (typical for Laie) so Chad said we should have a night surf at Turtle Bay. Just like that my dream was alive. We stopped off at Kahuku Grill on our way to hitting T-Bay with our wavestorms for an enjoyable man date in the water. Between having the ocean lit up by the spotlights at the resort and Grant and I catching a party wave topped off with a high five before the ride ended, I must say it was a fulfilling and worthwhile day. The lack of rust in my life and the abundance of fun activities with friends really coalesced into a positive weekend. so... pics?? i totally wanna see the before & afters.